Production: Ciné-Alliance (some sources state Sigma-Frogerais); black and white, 35mm; running time: 91 minutes. Released 18 May 1938, Paris. Filmed January-February 1938 in the Pathé-Nathan studios, exteriors shot in Le Havre. Producer: Grégor Rabinovitch (some sources list Simon Schiffrin); screenplay: Jacques Prévert, from the novel by Pierre MacOrlan; photography: Eugene Schufftan; editor: René Le Hénaff; sound: Antoine Archaimbaud; production designers: Alexandre Trauner with Paul Bertrand; music: Maurice Jaubert. Cast: Jean Gabin ( Jean ); Michèle Morgan ( Nelly ); Michel Simon ( Zabel ); Aimos ( Quart-Vittel ); René Génin ( Doctor ); Pierre Brasseur ( Lucien ); Edouard Delmont ( Panama ); Robert Le Vigan ( Michel Krauss ); Marcel Perès ( Chauffeur ); Kiki ( the dog ). Awards: Prix Louis Delluc, 1938; Académie du Film, Prix Méliès, 1938; Grand Prix National du Cinéma Français, 1939. Prévert, Jacques, Le Quai des brumes , in Avant-Scène du Cinéma (Paris), 15 October 1979. Beranger, Jean-Louis, Marcel Carné , Paris, 1945. Sadoul, Georges, French Film , Paris, 1947. Landry, Bernard, Marcel Carné: Sa vie, ses films , Paris, 1952. Quéval, Jean, Marcel Carné , Paris, 1952. Whitaker, Rodney W., The Content Analysis of Film: An Exhaustive Study of "Le Quai des brumes, " Ann Arbor, Michigan, 1966. Armes, Roy, French Film since 1946: The Great Tradition , New York, 1970. Gauteur, Claude, and Andre Bernard, Gabin; ou, Les Avatars d'un mythe , Paris, 1976. Missiaen, Jean-Claude, and Jacques Siclier, Jean Gabin , Paris, 1977. Ellis, Jack C., A History of Film , Englewood Cliffs, New Jersey, 1979. Milhaud, Sylvie, Jean Gabin , Paris, 1981. Pérez, Michel, Les Films de Carné , Paris, 1986. Brunelin, André, Jean Gabin , Paris, 1987. Turk, Edward Baron, Child of Paradise: Marcel Carné and the Golden Age of French Cinema , Cambridge, 1989, 1992. Variety (New York), 15 June 1938. Cinematographie Française (Paris), 12 August 1938. Monthly Film Bulletin (London), no. 62, 1939. Spectator (London), 27 January 1939. Sight and Sound (London), Spring 1939. New York Times , 30 October 1939. Manvell, Roger, "Marcel Carné," in Sight and Sound (London), Spring 1946. Lodge, J. F., "The Cinema of Marcel Carné," in Sequence (London), December 1946. Duvillars, Pierre, "Jean Gabin's Instinctual Man," in Films in Review (New York), March 1951. Daquin, Louis, "Les 20 Ans de cinéma de Marcel Carné," in Lettres Françaises (Paris), 1 March 1956. Sadoul, Georges, "Les Films de Marcel Carné, expression de notre époque," in Lettres Françaises (Paris), 1 March 1956. "Carné Issue" of Cahiers de la Cinémathèque (Perpignan), Winter 1972. Carné, Marcel, "Comment est né Le Quai des brumes ," in Avant-Scène du Cinéma (Paris), 15 October 1979. Magill's Survey of Cinema: Foreign Language Films , Englewood Cliffs, New Jersey, 1985. Revue du Cinéma (Paris), no. 466, December 1990. Leahy, James, in Monthly Film Bulletin (London), vol. 58, no. 687, April 1991. Faulkner, C., "Affective Identities: French National Cinema and the 1930s," in Canadian Journal of Film Studies (Ottawa), vol. 3, no. 2, 1994. Bates, Robin, "Audiences on the Verge of a Fascist Breakdown: Male Anxieties and Late 1930s French Film," in Cinema Journal (Austin), vol. 36, no. 3, Spring 1997. 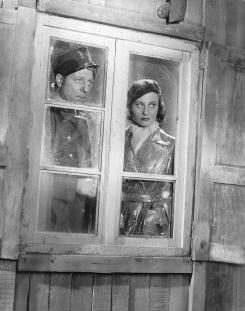 Marcel Carné's Le quai des brumes and Le jour se lève are examples of "poetic realism," a filmic style and narration often found in the French cinema of the 1930s. The term is, however, an unreliable critical rubric since the generalities and imprecisions associated with "poetry" and "realism" mask the specific elements of the texts it presumes to characterize. In the case of Carné, many of those specific elements can be traced to his collaborators. Assistant to Jacques Feyder, Carné was clearly influenced by the world-weariness of the older director's Le grand jeu and by the fascination of marginal lives in Pension Mimosas . Carné's first film, Jenny , stars Feyder's wife, Françoise Rosay. Other consistencies in Carné's films are provided by Jacques Prévert, who was responsible for all of Carné's scripts until the 1950s, as well as by the sets of Alexandre Trauner and the music of Maurice Jaubert. Jean Gabin, the hero of Le quai des brumes and Le jour se lève , is the actor whose persona most insistently dominates Carné's pre-war films. One of Gabin's mid-1930s' successes was in Duvivier's La bandéra , based upon a novel of Pierre MacOrlan, who was also the author of Le quai des brumes . The most apparent changes wrought by Carné and Prévert in MacOrlan's novel were the transpositions of time (from the turn-of-the-century to sometime vaguely contemporary) and place (from Paris to Le Havre). Carné, who would prove himself so expert in the rendition of period detail in Les enfants du paradis , opts here for a non-specific temporality, for an epoch that is both removed from and familiar to viewers. The port city is exploited for the degree to which it suggests the edge of the world, a jumpingoff place (enacted in the suicide of one of the film's characters), the place for final decisions, the place for taking the last chance. Whatever might have been specific to the real city of Le Havre (location shooting was begun there on January 2, 1938) is sacrificed to the evocation of port per se, the port of all ports, and to the allegorization of place appropriate to the film's schematics of plot and character. The "realism" of Carné's "poetry" is shrouded in the dark shadows and fog that enhance the elusiveness of the fiction. Plot is the skeleton required to sustain the trajectory of Jean, the hero, the deserter, from arrival (he materializes out of nearly pitch darkness on a deserted road) to departure (his death) through his encounter with the other desperate men and his love for a mysterious woman. The script provides little in terms of background or motivation beyond the basic tensions of its good/evil, outsider/bourgeois society oppositions. If lines such as "C'est difficile de vivre" (living is difficult) and "Oui on est seul" (Yes, you're alone) suggest a proto-existentialism, the incorporeal nature of the film's texture is distant from the tangibilities of existential art. But Le quai des brumes does generate a specific density through its enactments and stagings. Gabin may appear from nowhere, but he bears with him the weight of a highly identifiable presence, that of the most bankable star in French cinema. (In fact, it was Gabin's faith in the project that kept it from foundering when, just a few days before shooting was about to begin, the head of the production company financing the film, Gregor Rabinovitch, read the script and tried to dissuade the star from doing such a downbeat subject. Gabin persisted. He undoubtedly saw in the role of Jean a rich variation of the type of doomed hero that had brought him such success in Duvivier's Pépé-le-Moko , Grémillon's Gueule d'amour , and Renoir's Les basfonds .) The very young Michèle Morgan matched enigma to Gabin's mixture of strength and tenderness. Their first meeting takes place in a café that seems to be in the middle of nowhere. Shots ring out. A deserter and a woman wearing a beret and a transparent raincoat exchange names and fall in love. This configuration defines French film noir, its style and milieu, its challenge to bourgeois aesthetics and ethics. Here, far from the light of the natural world (in this darkness a patch of light is a privilege), far from families and social contexts, even far from conventional plots with their careful, "logical" identifications of situation and character, there flourish these emblems of gallantry and beauty. Gabin and Morgan retain something of their emblematic status for the duration of a fiction that so sharply designates good and evil. The lovers are tormented by the petty criminal (Pierre Brasseur, who figures so importantly in Les enfants du paradis ) and by the girl's guardian, the prototypical dirty old man. Played by Michel Simon (if Gabin is the most popular leading man in French cinema, Simon is its most popular character actor), Zebel, the character no one can bear to be with or see, locates the film's moral conflict in a contrast of surfaces, of beauty and ugliness. It is the very notion of surface, however, that distinguishes the film, that makes Le quai des brumes an examination of the concept of image. Near the beginning, Jean meets a painter who soon after commits suicide. He jumps off this "edge of the world" and provides Jean, the deserter, with the clothes and identity that take him through the rest of the film. The painter is tormented by the acuity of his own vision. He sees behind things, through things. He sees to the core of images, to their decay. He would paint Jean with his hands in his pockets, at night, in fog. This is a project for a portrait filled with signs of concealment. And in the space between the hidden and the revealed lies the truth. The painter is a surrogate for Carné and Prévert. What he says clearly defines the relationship between image (both visual and verbal) and meaning in the film. It is from this expression of style that character, narrative, and film are generated.